Well, this evening I am officially welcoming into my kitchen an early Christmas present…. A dehydrator! Excalibur, 5 tray. I almost bought white, to match the thermomix (hehe), but went with black in the end. So I am christening it tonight. It will be drying food while I dream. I couldn’t figure out what to start with though. I had big dreams of starting with kale chips or linseed crackers or fruit leather or something spectacular, but with the machine finally in my hot little hands it was all a bit daunting. So I took the safe, enter-the-pool-slowly-via-the-steps method rather than jumping in at the deep end. 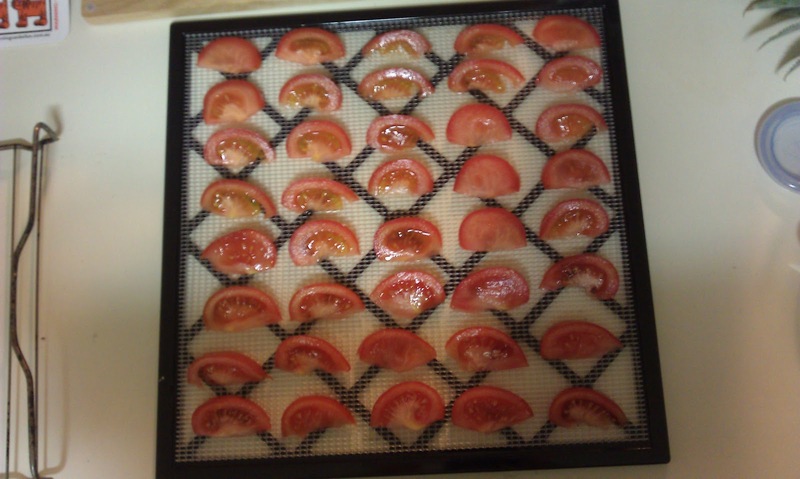 However, I can’t run a dehydrator overnight, using all that electricity, and only do a couple of trays. Of course. So all five trays are full! One tray of pineapple slices. 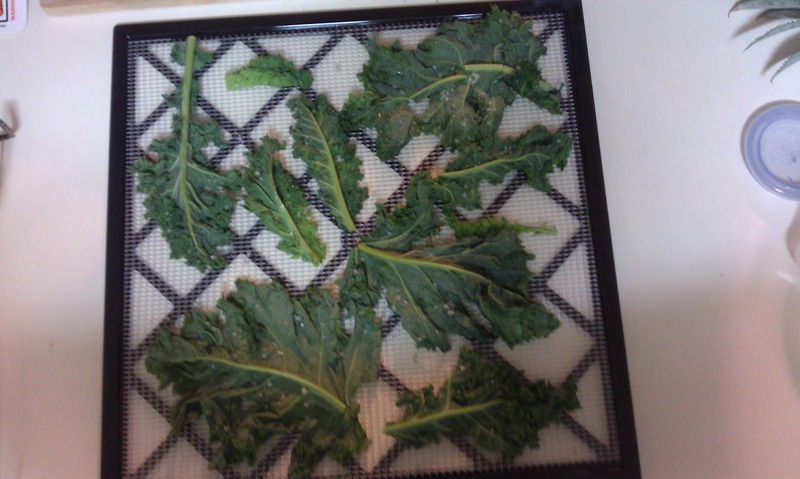 Two trays of kale (not the recipe for kale chips that I wanted to try, just plain kale). And two trays of tomatoes! My kitchen has been very busy tonight. 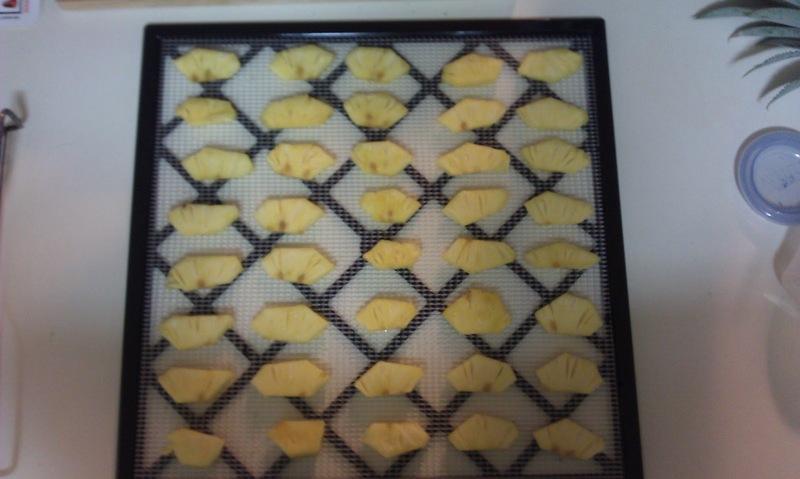 I have some jars sterilising in the oven, some jam cooking in the TM and lots of yummy foods drying in the dehydrator. Lots of machine activity. I’m suitably impressed with the dehydrator thus far… I had read complaints about it being loud, but… I mean, seriously, what do you expect? The thing blows hot air over food, it has to make some noise! But in actuality, it’s not bad at all. Much more quiet than the TM. In fact, it’s actually more quiet than the range thingo over my stovetop.I can’t wait to see what they look like in the morning! And I do have some exciting ideas brewing in my head, waiting to be tried dried. What are your favourite things to dehydrate? And what is the weirdest thing you have ever dehydrated (or tried to)?